While I got on with a provisional schedule in the absence of a Construction Manager, various things happened today. First, Ibrahim failed to pay Bob his wages despite the fact Ibrahim had promised Bob they would be paid before the 10th May. This is the second time Bob’s wages have been late. This morning Bob decided not to work because of it. I told Bob to go right ahead. Meantime, Issam promised to deal with it and he spoke to Ibrahim who promised that Bob would be paid by Friday at the latest. But since Ibrahim has broken promise after promise about wages being paid on time, why would we believe him? By the afternoon Bob was doing work for Ray Perry anyway. He’s a good egg, is Bob. Currently Talal (ATG’s owner) and Ahmed (Medinah’s original creator) were in town. Ahmed is usually in Qatar where he lives. I’ve been told he does not like being away from home. The fact he really needs to be here is a problem. Talal, on the other hand, seems to rarely be in Jordan. Instead he likes to spend his time travelling from place to place. London. Paris. I’m not sure where else but this is the first time he has been here that I know of since I arrived back on March 17th. The first description I heard of Talal was, “angry child”. Though I have not sat in one of his meetings with his staff yet, everything I have been told indicates it is painful for his employees. The reason Talal is here is allegedly two-fold; First, because Ahmed is here (I have been told Talal needs to, “keep a reign on the show’s creator and money-channel” – no comment on what this means – I’m just quoting what I’ve been told). Second, because another show has been thrown into chaos. ATG has a clause in its freelancer contract that states that if a freelancer quits they must refund all of their wages!!! I’m going to say that again because you won’t believe it. If a freelancer quits, ATG’s contract demands that they refund all their wages. “Malik’s” director was so fed up with ATG he agreed to go to the bank and refund 1/3 of his wages there and then. So ATG staff marched him to the bank and took back his money. Meantime, “Medinah” is also in chaos. Talal is refusing to meet the show’s designer. Why, I’m not sure. 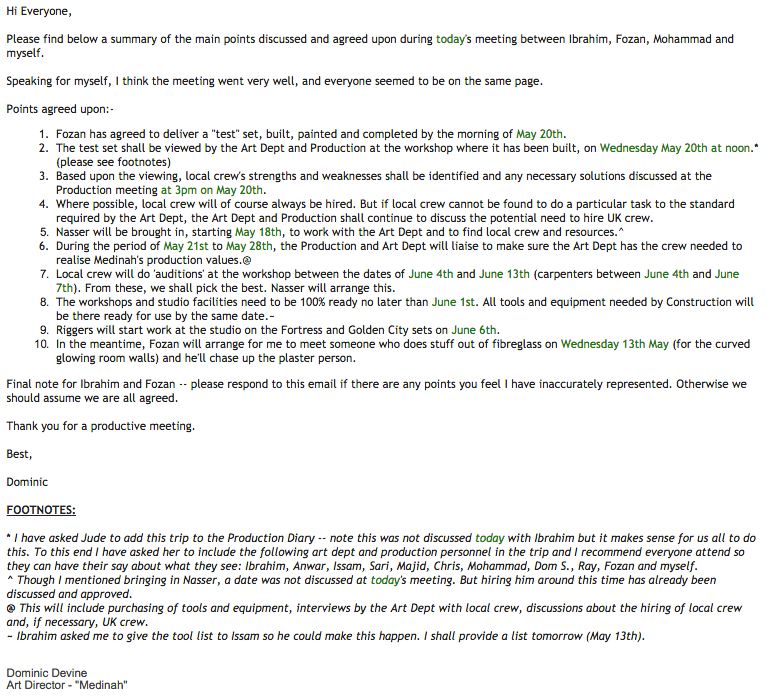 ATG hired international crew for “Medinah” not out of choice, but because it’s part of ATG’s contract with the financiers: ATG must use international HoDs in order to make sure “Medinah” is of a greater standard than their usual shows because ATG has no experience of making a show of this scale. It’s become clear that ATG is not happy about this. (There’s also another rule that anyone working on “Medinah” must not be working on anything else. But I have heard that the production manager, production coordinator, make-up artists and location manager are all involved in “Malik” and – possibly – the other unnamed show. It has also been often alleged that “Medinah’s” budget is funding the other two shows to some degree. Last time I checked this was called “embezzlement” – but so far it’s just a rumour). Anyway, Talal is refusing to meet Chris because Chris wants a UK Construction Manager and other UK crew. Now the show will be better for it. But Talal insists that local crews are just as good. However, ATG has shown me local crew work that they commissioned and frankly it’s atrocious – so while there may be good work somewhere in Jordan, ATG doesn’t seem to have anything to do with it. ATG acts like this does not matter, but it does. It matters because just as an audience member can often tell good acting from bad without knowing why, they can also tell when something looks real or like a set. And that destroys the ‘reality’ of fictional drama. So back to tonight. Chris – the designer – has been trying to meet Talal since yesterday but Talal has been ducking and diving. He’s finally, supposedly, meeting Chris today. But only because Ahmed is here so avoiding Chris is nigh on impossible. Earlier today, Chris told Issam that if Talal isn’t allowing him a UK Construction Manager he might as well quit. And if he quits, Simon Hunter – the director – has said he will quit too. It has come to the point that we may all be quitting tomorrow. So anther ATG show will have gone down the toilet in under 7 days due to their useless bloody-mindedness. You got to hand it to them; at least they’re consistent. This afternoon I had a meeting with Fozan and Ibrahim to discuss construction. Ibrahim told me that Fozan was to be the show’s Construction Manager. I queried this on the grounds that it was my understanding he was “Malik’s” CM. Ibrahim told me he is now 100% dedicated to “Medinah”. I could see that Ibrahim was lying. But I played ball, deciding to bring it up again when I had evidence. I agreed that we should pick up where we left off by having a test set built so we could assess local skills. I also recorded the meeting in case I missed anything. Eventually, I shall include it on this blog. But the best way to know what happened is to read the following email that I sent out afterwards. I was perplexed to see that while Ibrahim left the meeting after it ended with his copy of the specs for the “test set”, Fozan – who would be responsible for organising the building of the set – left his behind. How was he going to arrange the build with nothing to show to his construction people?